The Division of Administration and Finance supports the development and implementation of WHO/Europe’s strategy and programme budget. Its goal is to ensure that the administrative services are effective, efficient and compliant with internal and external audit requirements. The Division also aims to implement best practices in human resources; finance and account management; information and communications technology and administration; supplies; and conference services. provide reliable analysis and recommendations to the senior management for strategic and operational resource management. Dr Sussan Bassiri is a dentist by education, and holds a master’s degree in public health and a diploma in international business administration. Before joining WHO/Europe, Dr Bassiri was Director of Planning, Resource Coordination and Performance Monitoring at WHO headquarters in Geneva, Switzerland. She also held the positions of Senior Executive Officer in the WHO Director-General's office and, in the WHO Regional Office for the Eastern Mediterranean, Coordinator for Programme Management and Country Focus and Regional Adviser for Healthy Lifestyle Promotion. 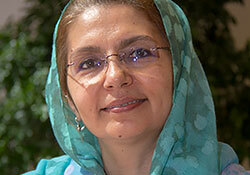 Dr Bassiri has over 22 years of experience working for WHO and the Joint United Nations Programme on HIV/AIDS.